Given that I have a couple of days getting bored people and although today had thought or talk about because space is curved with another thought experiment or give an introduction to that is or may be dark matter (matter that, by the seriousness, I makes me much) have decided to tone down a bit and return to my classics, show you pictures of the space and try to tell you that going. 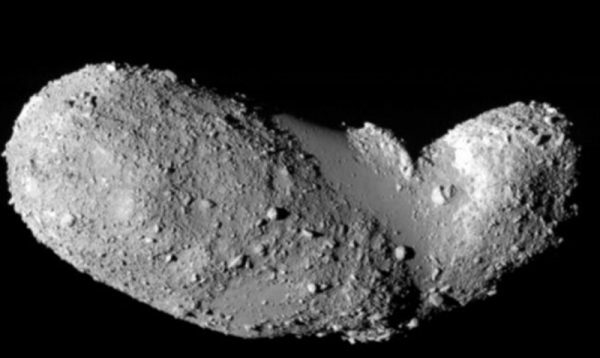 What you see is the asteroid Itokawa taken by the Japanese probe Hayabusa about 10 years ago and that will impact on Earth in many years, its orbit. In principle, an asteroid, see it at this stage of life, you should give equal and, although graceful form (potato), which stands out from this asteroid is that it has a part that is substantially smooth, smooth as culito a child and that is not nothing normal about an asteroid. Asteroids, by definition, so they are, are rugged, stroke of other asteroids, in addition, the materials forming an asteroid, smooth smooth, not many and, coupled with the low gravity they have, it is very normal to be rather rough. Remember that the asteroid itself, become larger by the gravity generated by attracting other asteroids or powder form around her that the bigger they are, the more attract. But, despite being “very large” at the bottom it is like quicksand because neither has enough size to become solid as demonstrated Rosetta landing in Churiumov-Gerasimenko. So why it is smooth in these areas ?. Because it is not known. And as I’ve said, that’s how nice since the difference between science and religion is that science does not know everything but recognizes it, looking for the why and progress, while religion seems that since he has created the answers for all that, this is false. Now, it is said, is discussed, it is rumored that this situation Itokawa is because it has different densities of materials, ie, that is not done all of the same, varying (therefore) gravity in the in different points (as in the earth) and therefore having more “sandy” than others and therefore softer areas. An example are the dunes are soft because they are less dense than the rock that is “spicy” for having more density, erosion is simpler in areas with lower density because they are less caked in areas with a high density (such as rocks) because they are more compact. It’s not the best example, but I think he understood. That itself is a theory as the probe sent to the comet by the Japanese did wrong, and although its module landed and took samples back to the probe achievement and lost. The probe landed on Earth.